This article will explain how to use your MERCUSYS router as an access point. The main router will be connected to the MERCUSYS router via LAN port (as seen below). The WAN port is not used for this configuration. How to log into the web-based interface of the MERCUSYS Wireless Router. Note: Though possible, it is not recommended to attempt this process over Wi-Fi. Go to Network>LAN Settings on the side menu, choose Manual and change the LAN IP address of your MERCUSYS N router to an IP address on the same segment of the main router. This IP address should be outside of the main router’s DHCP range. Go to Wireless>Host Network and configure the SSID (Network name) and Password. Select Save. 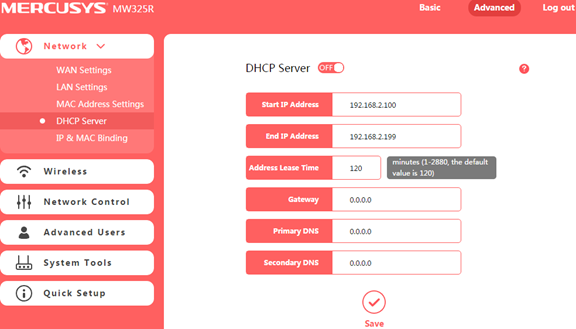 Go to Network>DHCP Server, switch off DHCP Server, click Save. Use an Ethernet cable to connect the main router to your MERCUSYS router through their LAN ports (any LAN ports may be used). All other LAN ports on your MERCUSYS router will now grant devices Internet access. Alternatively, any Wi-Fi device can now access the Internet through your MERCUSYS router by using the SSID and Password set up in the above steps.